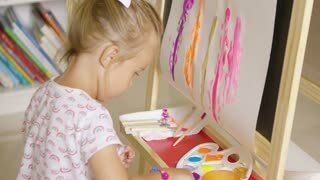 Little girl painting with her hand applying a palm print to a colorful abstract picture on an easel at home with brushes and an artists palette in front of her. Creative little girl painting an abstract picture on paper attached to an easel rubbing her hands with paint after applying a palm print to the paper. Portrait of Artist Sitting at Easel. Girl Mixes Paints on Palette With Brush and Paints on Canvas Picture, Sitting on Chair at Table in Art Class. Woman Sitting and Painting at Easel. Artist Mixes Paint on Palette With Brush and Paints on Canvas Picture, Sitting on Chair at Table in Art Class. 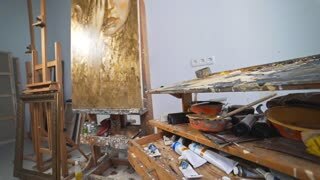 Beautiful Girl Artist Paints Picture With Brush and Apply Paint to Canvas, Listening to Music and Dancing in Front of Easel Among Large Art Studio. Happy attractive little blond girl artist rubbing her ands with a cute smile after applying palm prints to her abstract painting on an easel black board at home or in kindergarten.